Earth Sky + Water, LLC based in Wilton, New Hampshire, is a small publishing company with a tight focus: localized nature identification and the realistic depiction of nature. 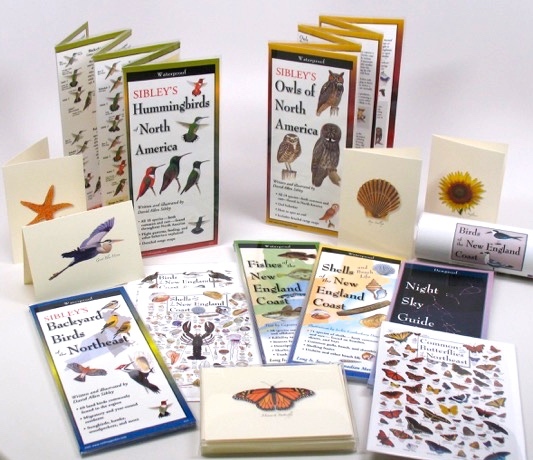 We publish a series of laminated, fold-up nature identification guides called FoldingGuides™ to various regions of North America, including titles on the coastal birds, backyard birds, salt and freshwater fishes, trees, butterflies, mammals, whales, even the apples the Northeast! There are currently over 102 FoldingGuides™ in the series with 19 FoldingGuides for the New England region. In addition to FoldingGuides™, we offer a line of beautiful identification posters --sold in tubes, or matted-and-framed, as well as over 500 customizable greeting cards and 119 boxed note assortments, all using field guide art from Roger Tory Peterson, David Sibley, Ernest C. Simmons, Val Kells, Fiona Reid, Pieter Folkens and other well-known illustrators. All of our products are designed, manufactured, and assembled here in New England, using paper made in NH at Monadnock Paper Mills whenever practical. We market, sell, warehouse, and ship everything from our offices here in Wilton, New Hampshire.